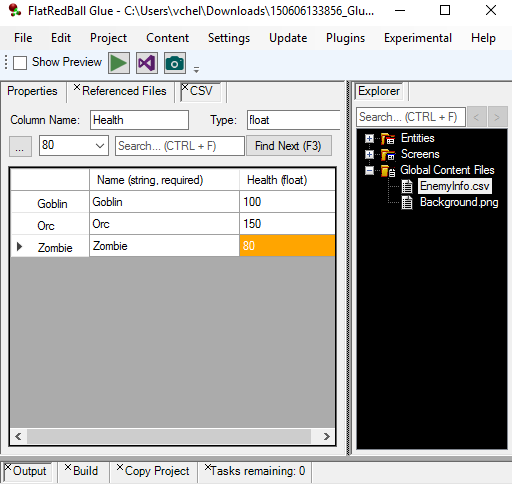 Files in Glue can be accessed in code. Files added to global content can be accessed in any location. Files added to screens and entities can safely be accessed within the respective screen or entity’s custom code. Files from other screens or entities can be accessed so long as the owning screen or entity has had its LoadStaticContent method called. Files added to a Screen or Entity create a member which can be accessed in code. For example, if a .png file is added to an Entity, it can be used to assign a texture on a sprite. 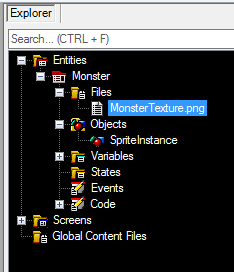 In the example below, Glue will generate code for a Texture2D called MonsterTexture . This will create a folder both in Glue as well as on the file system.